Sugar contributes to tooth decay because it decreases the effectiveness of a particular type of white blood cell that “eats” bacteria. Sugar causes the body to release more adrenalin, which may explain hyperactivity in young children. Calcium loss in urine occurs when a person consumes a soft drink containing sugar. Ingesting sugar makes the pancreas work harder to produce insulin. Diabetes results when the overworked pancreas’ can no longer eliminate sugar from the blood stream. White refined sugar is bleached with chlorine, which, when it comes into contact with certain organic compounds, converts to dioxin, a lethal compound. Sugar can hinder weight loss because high insulin levels (see # 5 above) cause the body to store excess carbohydrates as fat. Sugar increases the likelihood of chronic fatigue. Sugar increases mood swings, irritability and anxiety. 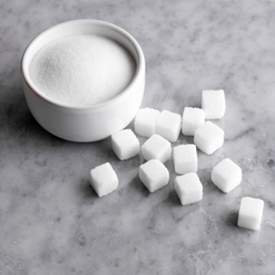 Sugar compromises the immune system because it lowers the efficiency of white blood cells for a minimum of five hours.